This week, Michiganders and others will have their chance to say goodbye to the late Congressman John Dingell. John Dingell died last week. He was 92. He served longer in Congress than anyone in U.S. history. Former constituents, friends and colleagues paid their respects to the late Democratic Congressman John Dingell at a public visitation at the Ford Community and Performing Arts Center in Dearborn Monday. Tuesday's public funeral mass for Dingell will take place at Dearborn's Church of the Divine Child at 11:00am. 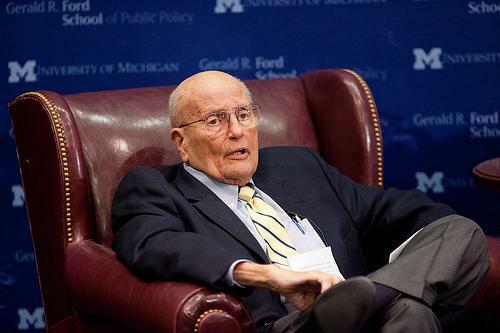 Visitors on Monday remembered Dingell for his accomplishments as the longest serving member of Congress in U.S. history, and his personable style. "He [was] a loving, caring compassionate guy," said Macomb County Executive Mark Hackel. "He could open the door for a conversation with anyone. And having him as a representative as the state of Michigan, that was extremely important to us. Because he got a lot of things done as a result." Republican Macomb County Public Works Commissioner Candice Miller served in Congress alongside Dingell for 12 years. "Whether it was protecting our magnificient Great Lakes, or his beloved auto industry, he has just been such an unbelievable personality -- and committed to obviously to public service," Miller said. "He truly is what American Democracy should be about. [I] love John Dingell." Ishmael Ahmed, former director of the Michigan Department of Health and Human Services and co-founder of the Arab Community Center for Economic and Sociall Services (ACCESS), says Debbie and John Dingell have been vocal supporters of the Arab American community in Michigan. "I've known the Congressman for many years," said George Moroz, with The Henry Ford. "He was the epitome of public service. His fingerprints are on every piece of major legislation over the past 50-60 years and I wanted to pay my final respects to him and his wife." Former Vice President Joe Biden and U.S. Rep. John Lewis will join mourners at funeral services to be held Tuesday at Dearborn’s Church of the Divine Child. Later in the day, a motorcade will carry Dingell’s body past the Capitol Building in Washington D.C.
Former President Bill Clinton and former Speaker of the House John Boehner will speak at another funeral service Thursday in Washington D.C.